If you aren’t getting new dinner ideas or don’t want to make chicken curry or chicken casserole anymore, try this chutney chicken. This chicken dish bursts with flavors of mint and coriander and is bound to make you and your guests happy. I found the original recipe in Chef Sanjeev Kapoor’s book but have have modified it a bit to suit my liking. You can also serve it as a starter if you put it on satay skewers. 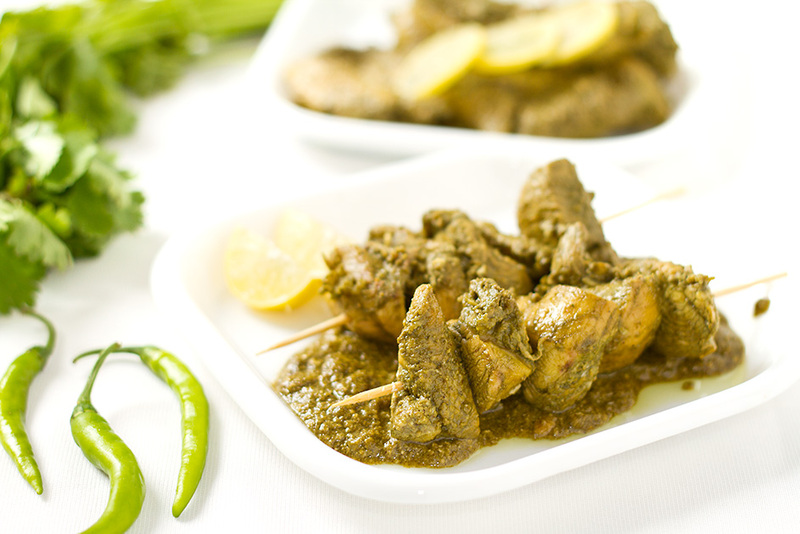 While I have used ghee, you can make this mint coriander chutney chicken without any oil. Just remember to use a non stick pan if you are making it oil-free. Either ways, this is a healthy recipe. The word “chutney” is derived from the Hindi word chatṭnī, meaning to lick. Chutneys can be made from almost any combination of vegetables, fruits, herbs and spices. Chutneys are usually grouped into sweet or hot forms; both forms usually contain spices, including chili, but differ by their main flavours. Similar in preparation and usage to a pickle, simple spiced chutneys can be dated as far back as 500 BC. Originating in India, this method of preserving food was subsequently adopted by the Romans and later British empires, who then started exporting this to the colonies, Australia and America. The tradition of chutney-making spread through the English-speaking world, especially in the Caribbean and American South, where chutney is still a popular condiment for ham, pork, and fish. Dry roast cumin seeds, coriander seeds, peppercorns and cloves and grind them. Pick coriander and mint leaves, chop them finely along with green chillies. Mix the greens with roasted and ground masala and make a fine paste in a wet grinder. In a bowl mix yoghurt, salt and garam masala. Add the green chutney paste and marinade the chicken in this mixture for an hour or so. Heat a pan, add ghee and saute the marinated chicken. Cover and cook on medium heat till the chicken is cooked. Thicken the gravy by increasing the heat and serve this chutney chicken with lemon wedges. Use it as starters, snacks or a side dish, I love to eat Chutney Chicken with parathas for a quick dinner on a workday.